All transactions are safe and secure with a reliable history in online purchasing behind each of our associates. 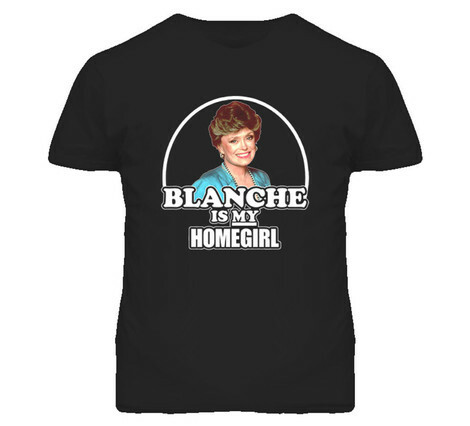 Buy the Blanche is My Homegirl t-shirt to own Golden Girls clothing and merchandise. Let everyone know that the most desirable woman in town is your homegirl. Tell them that you learned about dating from Blanche (Rue McClanahan) who has the uncanny ability to pick up men everywhere she goes, including The Rusty Anchor piano bar where she gets her fresh pick of sailors. Maybe the two of you can do a duet. Wear this Golden Girls Blanche t-shirt and put on a performance of your own. Like Blanche Devereaux's Rusty Anchor performances, you'll likely garnish a few cheers in this homegirl tee. In addition to the Blanche is My Homegirl tee above, browse the Golden Girls Clothing Gallery for more apparel like men's and women's clothes, kids shirts or hoodies.